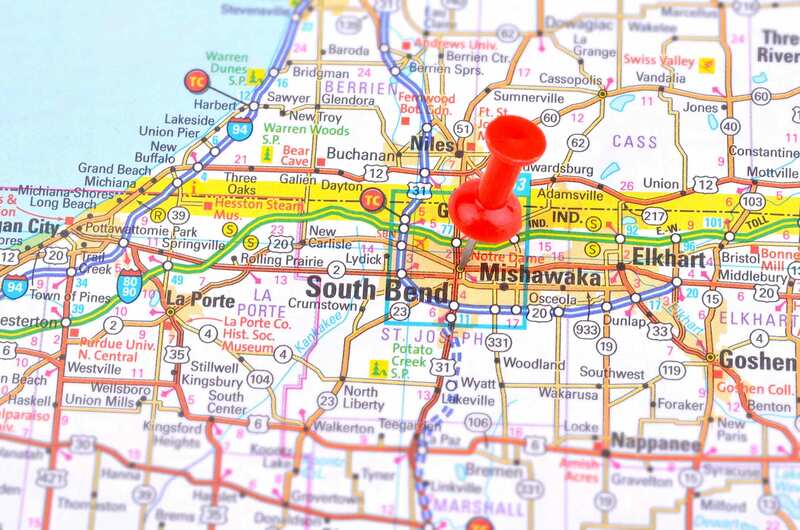 Full of exciting stories of explorers, settlers and industrialists, South Bend, with a population of 266,709, is the fourth largest city in Indiana. In December 1679, French explorer Robert Cavelier, sieur de LaSalle arrived at what is now Riverview Cemetery. Later LaSalle and Native American leaders met under a tree named the Council Oak to sign the Miami Treaties. However, the first permanent settler was Pierre Navarre, who married a Potawatomi woman. Navarre built a cabin on the north side of St. Joseph River in 1820 and created a trading post for the American Fur Co. Three years later Alexis Coquillard started a fur trade in the area as well, naming it “The Bend,” which is where the city’s eventual name derives. About 20 years later, the Very Reverend Edward Sorin and six Catholic brothers founded the University of Notre Dame, and 13 years later, St. Mary’s College moved from Bertrand, Michigan, to South Bend. Known for its rich college football legacy, it makes sense that the College Football Hall of Fame opened in South Bend in 1995. The city’s location near the St. Joseph River made it possible for companies such as Studebaker, the Oliver Chilled Plow Works and South Bend Lathe to thrive. 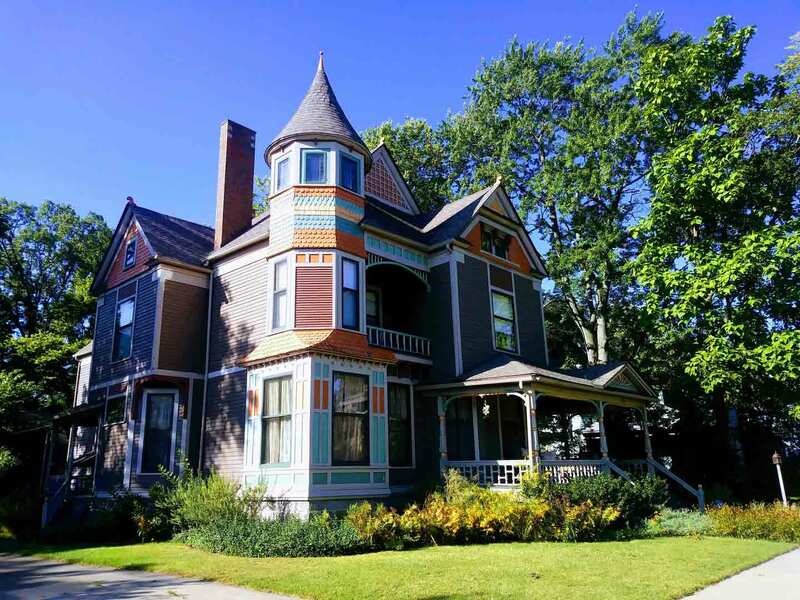 A Queen Anne-style home built in 1892 by the Fredrickson family, Innisfree Bed and Breakfast is on the local and national historic registry. The house became a family counseling center after it was moved to its current location in the 1980s. Cindy Werner turned the home into a bed and breakfast, and 12 years later Mahan and Stephanie Mirza bought the house in 2016. Innisfree features gardens, two dining rooms and three parlors. The five guest rooms are named for people of note such as Michael Collins and Grainnie O’Malley. A minimum two-night stay is required during weekends during football season. While children are permitted, the historic home isn’t childproof and contains antique and fragile objects. Pets and smoking aren’t allowed. Oliver Inn Bed and Breakfast features 19th century architecture and modern amenities. Originally, Dr. Lewis Pagin built his home on this site in the 1870s. However, James Oliver, of Oliver Chilled Plow, purchased the house and moved it to South Scott Street to be used as the rectory of St. Hedwig Parish Church rectory. Oliver then built the present house. The home was donated in 1987 after the death of Gertrude Oliver Cunningham to the Northern Indiana Historical Society. The house features seven fire places and original Waterford crystal sconces. Eight of the 10 rooms include private baths, TVs, air conditioning and ceiling fans, and some rooms have fireplaces or hot tubs. In 1912, a two-story, three-bay Tudor Revival-style carriage house was built in the back of the property. Guests can enjoy a candlelight breakfast by the fire with live piano music, and the Butler’s Pantry features complimentary snacks and drinks. The History Museum features attractions — The History Museum, Studebaker Museum and Oliver Mansion. Formerly the Northern Indiana Historical Society, established in 1867, the History Museum is Indiana’s second oldest historical society. The museum features fashion, French exploration and architecture at Notre Dame exhibits. Once home to the J.D. Oliver family, the Oliver Mansion features 38 rooms, leaded glass windows and 14 fireplaces. Museum hours are 10 a.m.-5 p.m. Monday-Saturday and noon-5 p.m. Sunday. The Kidsfirst Children Museum is open 10 a.m.-2 p.m. Monday, Wednesday, Friday and Saturday. Admission varies on age and museums visited. 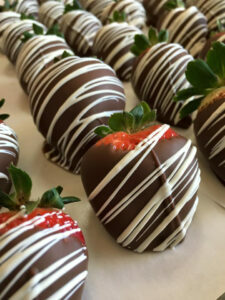 Founded in 1991 by Mark Tarner, the South Bend Chocolate Company began making chocolates — Domer, Rockne and Nuts for ND — under a license from the University of Notre Dame. Tours of the 60,000 square-foot facility are available 8 a.m.-4 p.m. Monday-Friday and 9 a.m.-2 p.m. Saturday. Cost is $5 adults and $2 for children under 11. Visitors learn about the history of chocolate as well as techniques such as panning and enrobing, and dip a chocolate spoon. The Chocolate Museum features one of the largest collections of chocolate memorabilia in the world, including a 1,300-year-old-Mayan chocolate pot. The South Bend Chocolate Company produces more than 500 different chocolates daily. Open since 1969, Barnaby’s specializes in pizza and sandwiches. Barnaby’s won the South Bend Tribune Reader’s Choice Favorite from 2003-10, 2012 and 2015. Owner John Stratigos followed in his grandfather’s footsteps in more than one way. The address of Barnaby’s is actually the address of his grandparent’s home before it was torn down. His grandfather, Spyridon Stratigos, owned the restaurant and bar Stratigon from 1914 to 1963. Stratigos took over Barnaby’s after his father, George, died. Barnaby’s is available for birthday celebrations, corporate lunch delivery, business lunches and catering. East Bank Emporium Restaurant has a storied history in South Bend. The first tavern opened in the building in 1912. Throughout its existence, the building was once a porcelain works, tombstone factory and a sign company, and an empty warehouse for 15 years before the restaurant opened.